Tomorrow morning I join with colleagues, students and the community to raise a flag to mark the beginning of NAIDOC week. We will acknowledge the Bidjigal people, traditional custodians of the land. We will also pay respects to the Elders both past and present of the local Aboriginal Community and extend that respect to Aboriginals attending. Around 8,000 years ago near to the University where I work, Aboriginal people would gather at a campsite. They would hold meetings, teach and share knowledge. Aboriginal groups emerging in the 1920’s sought to increase awareness in the wider community of the status and treatment of Indigenous Australians. The National Aborigines and Islanders Day Observance Committee, NAIDOC, is a celebration of Aboriginal and Torres Strait Islander cultures and an opportunity to recognise the contributions of Indigenous Australians in various fields. The Indigenous Programs Unit, Nura Gili, provides pathways for prospective Indigenous students to study in all UNSW faculties and programs. They also provide a range of Indigenous student support services, tutorial and study spaces for enrolled students. The Hub, part of Student Life and Learning and Nura Gili will be providing an opportunity for students, staff, volunteers and community members to engage with each other. To celebrate the achievements, history and culture of Aboriginal and Torres Strait Islander People. 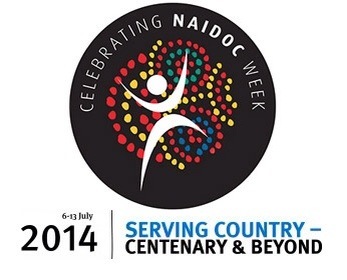 Serving Country: Centenary and Beyond is the theme of NAIDOC this year. It will honour all Aboriginal and Torres Strait Islander men and women who have fought in defence of country. From warriors in the Frontier Wars to warriors who have served with honour and pride in Australia’s military conflicts and engagements across the globe. This coming week seeks to highlight and recognise the role they have played in shaping our identity and pause to reflect on their sacrifice. We will celebrate and honour their contribution to our nation. I am honoured to be part of a tradition that acknowledges and raises awareness of the past and continuing contribution of the Aboriginal and Torres Strait Islander people to Australia. The future of this heritage is in the hands of all that participate in NAIDOC week in 2014 and the years to come. I hope you shared a good time with everyone on this day. I imagine that there would be many similarities between the indigenous people of America and Australia. As a relative new comer to this country I feel a sense of shame and guilt at the way the aborigines are treated.